The Beijing-based firm Bitmain announced the release of their new 7nm miners Antminer S15 and Antminer T15 which went live on sale on November 8, 2018. The company announced that the new devices will feature their new BM1391 ASIC chip recently released by the CEO Jihan Wu, at the World Digital Mining Summit in September. The 7nm chip is surely packed with features that improve upon the efficiency and performance of its predecessors. According to Bitmain, the ASIC chips are capable of reaching peak energy levels at 42W/TH, and that the S15 and T15 are designed to offer “industry-leading hash rates”. The new models will mine BTC, Bitcoin Cash (BCH), and other coins that run on the SHA256 algorithm. Bitmain’s new announcement comes right after similar announcements and device previews from their rivals. Companies like Ebang and Bitfury have recently come up with miners that are lauded to have higher levels of efficiency and performance - not until Bitmain’s latest release of the S15 and T15 though. One more factor that can solidify Bitmain’s position as a leading company in the mining industry is its public listing on the Hong Kong Stock Exchange, a process which has lingered for quite a while, but is expected to be concluded sometime later. However, the company has been facing challenges relating to its earlier investments in BCH, one which has turned out in a loss of about $400 million in the Q2 of 2018. The general crypto market hasn’t helped matters either. Price is the most important feature as this is the main thing buyers consider. The Antminer S15 is selling for around $1475 while the Antminer T15 goes for a significantly lower price of $913. So the T15 has an edge when it comes to pricing. You do not need to worry about buying an additional PSU because both machines come with power supplies. However, you will need a compatible power cable. The S15 has a very high performance level, estimated to reach a hash rate of up to 28 TH/s while the T15 has a maximum hash rate of 23 TH/s. The S15 has a power consumption rate of 1596 W while the T15 is at 1541 W. so, both of them are relatively similar in this regard. It is always necessary to consider the profitability and overall ROI. 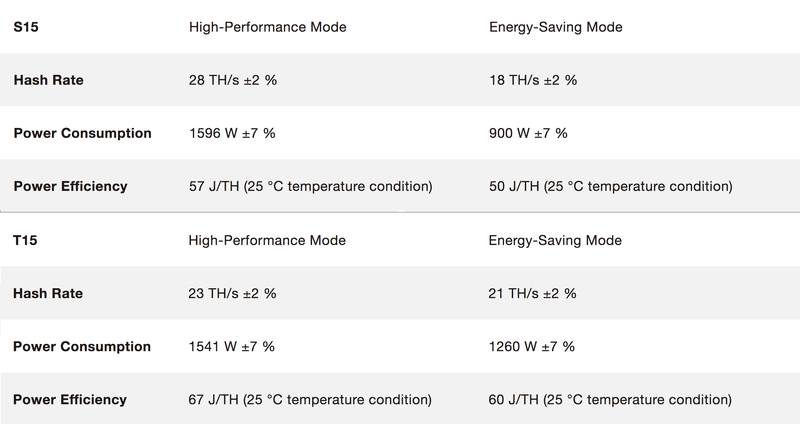 According to whatomine (using a moderate energy cost of $0.10c/kWh), Mining with the S15 will earn you $7.26/day while the T15 will earn you $5.44/day. With the AntMiner S15, you break even in 210.83 days, while for the AntMiner T15, you break even in 175.02 Days. Mining profits generally took a downward slide recently anyway, so this won’t be bad.